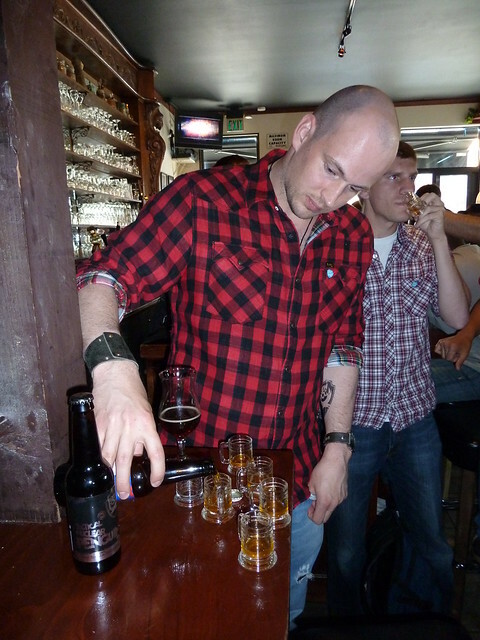 Today is the 36th birthday of Jame Watt, co-founder of the Scottish brewery BrewDog. I first met James in Philadelphia during Philly Beer Week in 2009. Bill Covaleski, Greg Koch and I took James for his first cheesesteak at Jim’s after a beer event. I’ve run into him a few times since then and it’s always a good time. Join me in wishing James a very happy birthday. 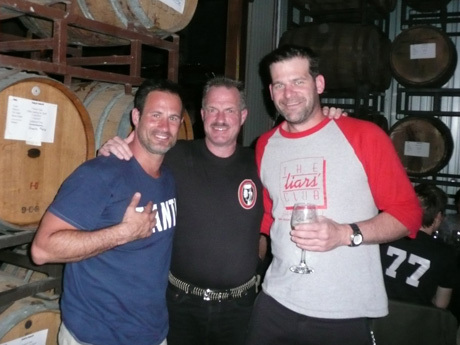 Dana Blum, then with Anchor Brewing, James, and me at Monk’s Kettle in 2010. 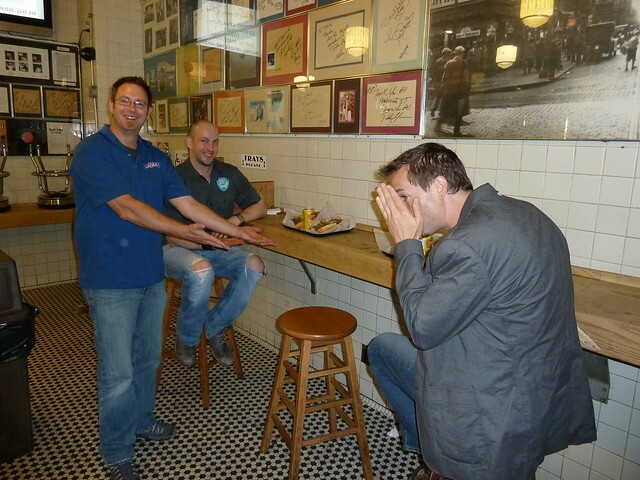 Late night at Jim’s Steaks: Bill Covaleski showcases our cheesesteaks as James Watt looks on and Greg Koch tries to hide his face. 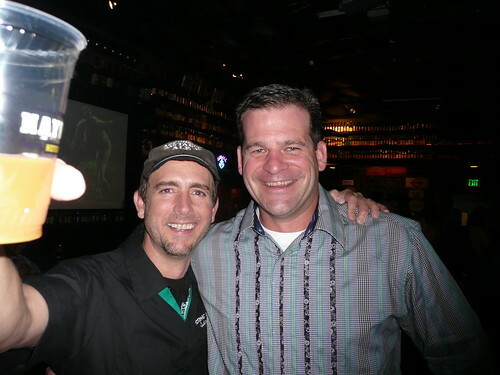 Today is the 44th birthday of Jeff Bagby, who until a few years ago was the head brewer extraordinaire at Pizza Port in Carlsbad. There, you used to be able to read the entire biography of Jeff “Extra Spicy” Bagby. I’m not sure when it was written, but it’s no longer there, but it ended with the following sentence. “Jeff has his sights set on winning a GABF Brewpub of the Year award and we most definitely believe it is in his future as well.” Eight years ago at GABF, Jeff won an amazing seven medals and Pizza Port Carlsbad was awarded the Large Brewpub and Large Brewpub Brewer of the Year. That means his plaid pants got to go up on stage a record eight times! You can see a retrospective of Jeff’s plaid choices over the years, too, at Jeff “Lucky Pants” Babgy Wins Big. 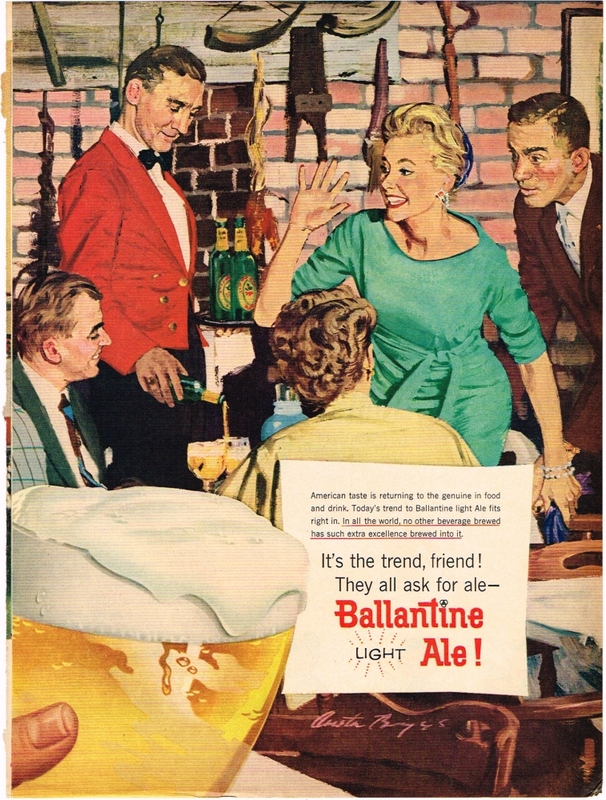 Once he started working on opening his own brewery, I suggested he should consider “Plaid Brewing” or some variation of that idea, like “Plaid Pants Brewing” or “Lucky Plaid Brewing.” Unfortunately, he went with a more sensible Bagby Beer Co., which opened a few years ago. 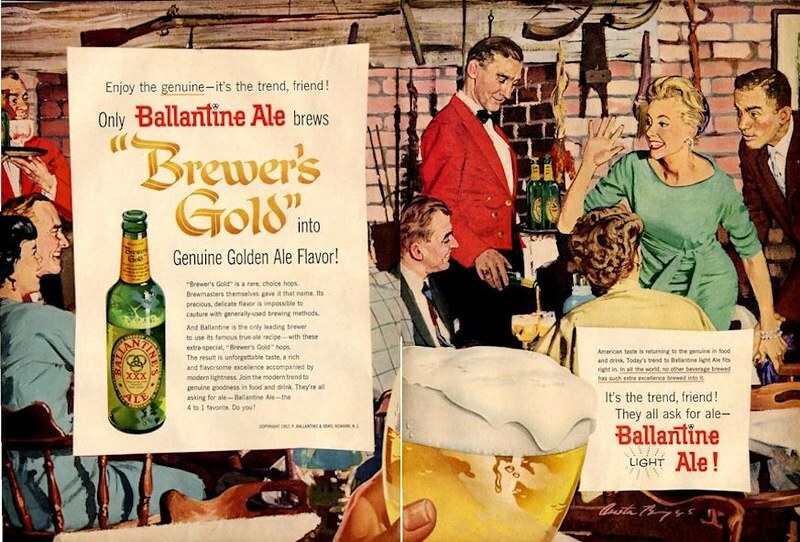 All, well some, kidding aside, Jeff is a terrific brewer and a hell of a washoes player, though I still think Dave Keene and I could beat him and Tomme again. Join me in wishing Jeff a very happy birthday. Jeff with his then-girlfriend, now wife, Dande at GABF a few years ago. And yes, those are his lucky pants. Greg Koch and Jeff at the Falling Rock. 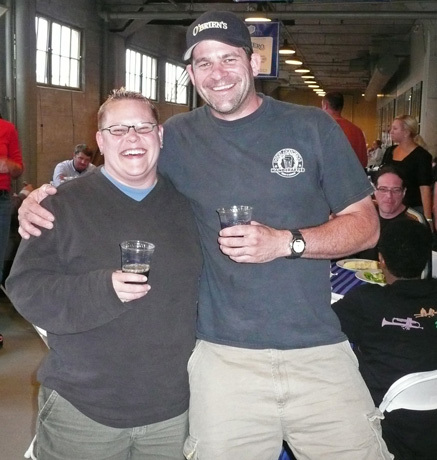 Former Drake’s brewer Melissa Myers with Jeff at an event at Anchor celebrating the Toronado’s 20th anniversary. 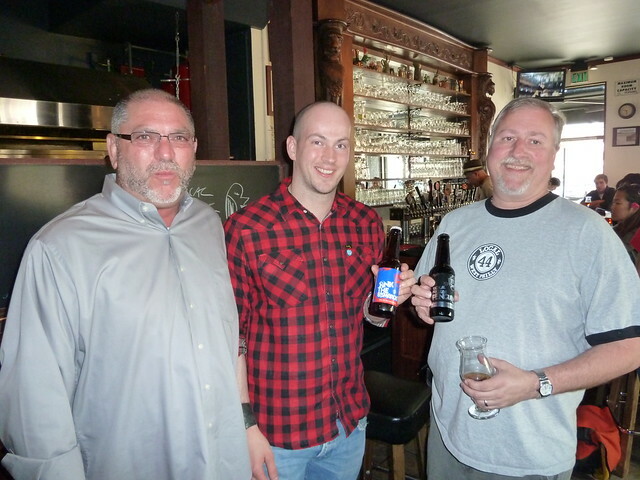 Sam Calagione, Bruce Paton and Jeff at the Lost Abbey for a beer dinner during CBC. 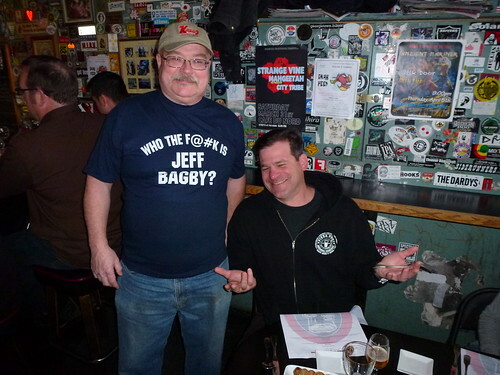 Jeff at the Toronado for the annual Belgian Beer Dinner in 2012, with owner Dave Keene wearing his “Who the F@#k is Jeff Bagby?” T-shirt. 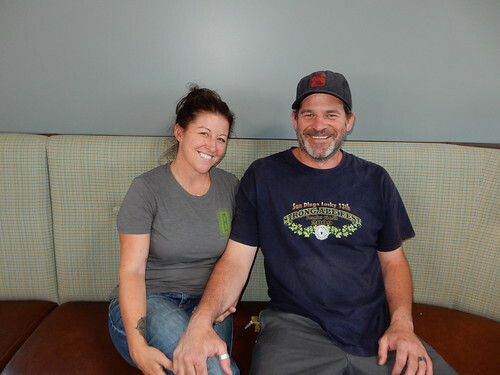 Dandelian and Jeff Bagby in the upstairs loft dining area of their new brewery. The plaid back of the bench seating was inspired by Jeff’s winning plaid pants that he used to wear for GABF award ceremonies, as I detailed several years ago in Jeff “Lucky Pants” Bagby Wins Big.